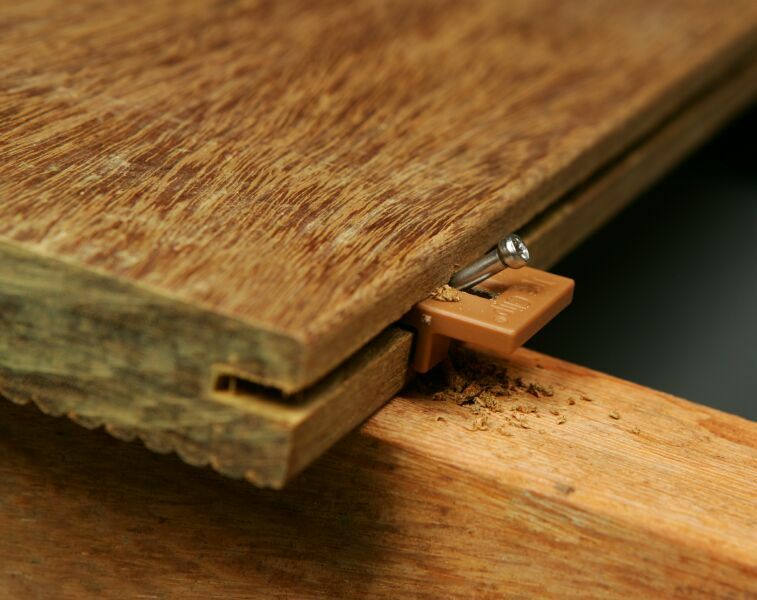 The Ipe Clip Extreme requires a groove (kerf) cut into the side of the deck board. We do this in our inhouse mill shop or you can do it on the jobsite with a biscuit cutter tool. Well over 90 percent of our contractor customers have us pre-groove the board. It reduces labor on the jobsite. 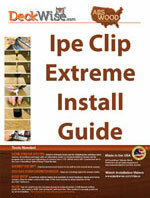 Why to Use: Local builders recommend the Ipe Clip Extreme ® system. Their reasoning is that the Ipe Clip Extreme ® is quicker to install and is much easier to use than other systems. Unlike other hidden fasteners the Ipe Clip Extreme ® is installed completely from the top of the deck. Frequently decks are either high or very close to the ground. In these cases, a below deck hidden fastener would either require a ladder or laying on the ground. Either way it would require you to be constantly looking up and turning your head and neck into a cramped and un-natural position. The Ipe Clip, being installed from the top of the deck requires no additional body strain. Support: We have expanded use of the Ipe Clip Extreme ® for any of our conventional decking by supplying complementary Garapa, Cumaru, or Tigerwood plugs. Biscuit Cutter: By far the majority of Contractors and Retail Customer have us groove (kerf) their decking at our Mill Shop. However, if you prefer to cut your own grooves the the best method is with a Biscuit Cutter. Settings: Use a #2 Blade and center the Biscuit Cutter on the decking. The models vary however be sure to use either 3/4″ or 1″ depending upon the decking involved.